Stamps Ahead: Boppard on the Rhine River. This photo of me was taken on 2 November, 1990 when I was on a 35 day coach tour of Europe. I am wearing my Ken Done top purchased at his shop down in The Rocks area of Sydney. Boy, did I feel special wearing it, and also showing off an Australian artist at the same time. If I remember correctly I got lots of comments from people I met. Here is the inspiration photo from ARTastic for this month - Ken Done's Sydney night. The criteria was a city theme. Now, technically Boppard is a town and municipality on the Rhine River in Germany not a city BUT I had the photograph above sitting around just waiting to be rehoused (it was previously in a very old non acid free album) so it seemed appropriate for this challenge. Ken Done's first solo exhibition was held in Sydney in 1980. Since then, he has held over 50 one-man shows, including major exhibitions in Australia, Europe, Japan, and the USA. 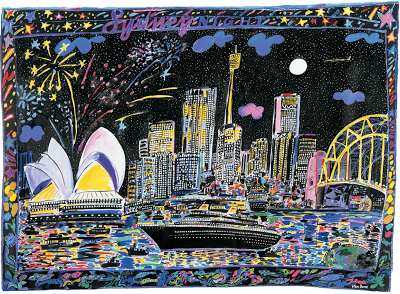 His work has been described as the most original style to come out of Australia, and his paintings are held in collections throughout the world. I still have several scarves with his designs on them from his early days. I would like to thank LarkinDesign I happened upon her video and loved the way she used her papers. I knew I wanted to put watercolour paint on my layout as my nod to Ken Done's artwork. Vogue once said “You can hang a Done on your wall or a Done on yourself”. What a lovely meeting - Ken Done as inspiration and you are wearing his art! Beautiful layout with great colors! Thanks for joining in with our challenge at ARTastic! Loving all the colours you have picked out from the challenge. It is a great page and we really appreciate you joining us at ARTastic this month. We hope you will join us again next month for another great challenge. So bright and vibrant Margaret, well done. Thank you for playing along with us at ARTastic. SO COOL that you had a photo of you wearing that coat for this challenge. Great layout. Thanks for creating with us at ARTastic! Gorgeous layout! Love how you have combined the colours. Many thanks for joining in with us on ARTastic. Love your fun, vibrant page. Thanks for playing along with the ARTastic challenge this month.